Some of the most important things to look for in a drone case is; durability, protection, a place for everything else (remotes, batteries, and more) and obviously a company that will stand behind its product backing it up by a great warranty. All of these things and more can be found in the Lowepro CS 400 DroneGuard backpack style carrying case for drones. Like I said earlier, I have been using Lowepro as far as I can remember for my photography equipment and I’m really excited to take a closer look at the CS 400 DroneGuard to see if the same craftsmanship carries over to their entry into the drone market. The outside of the DroneGuard CS400 is soft but yet the frame is very tough and rugged feeling. With how they designed the outside, it would take a lot of pressure to push the outside inward, which is good for protecting your drone and accessories too. The front of the backpack has straps where you could attach additional things, such as a carabiner or even slide in a few extra propellers. Here is a bottom or side view of the case which shows the rugged egg carton style construction which gives the case a lot of durability! The zippers are also seen here, which have large loops for easy access and ease of unzipping the case. There is a strap located on the top of the bag which makes carrier the case easy, if you do not want to throw it on your back. If you are the backpack type, then you’ll find the straps very comfortable and adjustable as well. There is also a very soft gel-like construction to the back so its extra comfortable when you have the case on your back. I also noticed a lot of double stitching of the fabric which is a great thing to see and should hold up to some abuse over the years. There is also a zipper pouch on the front, and while it does not open very large, it is enough room to slide in a manual or maybe a flight log book. Also on the back near the straps, there is a loop for maybe a flash light or pen for recording your flight logs. 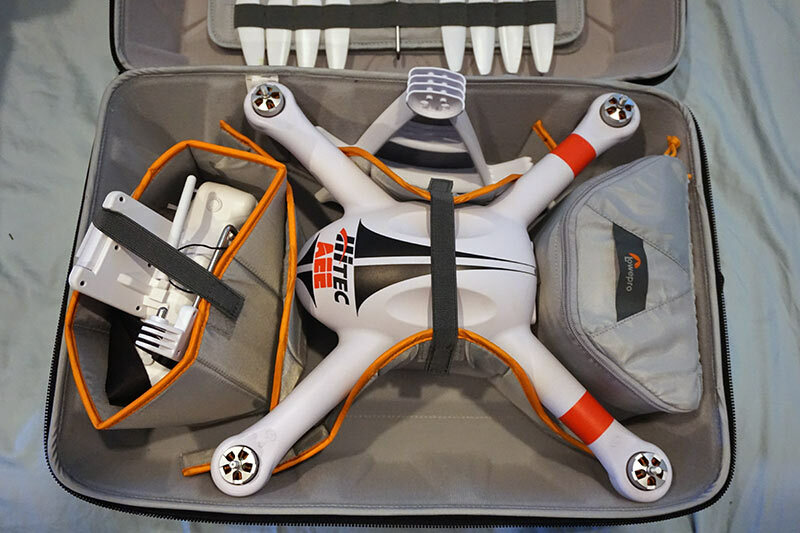 Opening the CS 400 Drone Guard backpack we can see how things are laid out inside. On the left side which is the top of the bag, you have an area for storing propellers and a zipper for some smaller things like tools. On the right side, we have a completely adjustable and customization area for storing your drone, transmitter, batteries and all of the accessories that go with it. Taking a closer look at the main storage area we find on the left a place for your transmitter, perhaps a WiFi repeater, and maybe even a charger for the transmitter. In the center we have the adjustable padding for your drone to keep it in place and then on the right side a zipper pouch for everything else. The propeller area offers plenty of storage for props, eleven to be exact. There is also a small zipper pouch, where I plan to store some tools like wrenches and screwdrivers. One of the cool things about the prop storage is that its completely removable. So this can act as a tools bag for the field allowing you to take it with you directly to your takeoff and landing area of your drone in case you need to swap props or make in-field repairs. So that’s the Lowepro DroneGuard CS400 and some of the features for it. Read on to the next page and we’ll make it field ready with our own Hitec Q-Cop 450 drone!